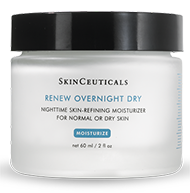 SkinCeuticals Renew Overnight Dry – A nighttime skin-refining moisturizer with fruit acid blend to hydrate and smooth the skin and fight dryness. Renew Overnight Dry is ideal for normal or dry skin and contains a 10% hydroxy acid blend to gently exfoliate dead skin cells for a healthier appearance. 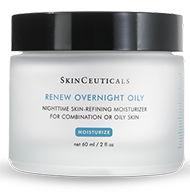 SkinCeuticals Renew Overnight Oily – Ideal for combination or oily skin, Renew Overnight Oily is a nighttime moisturizer that diminishes the appearance of fine lines and wrinkles by exfoliating and hydrating the skin. Its 10% hydroxy acid blend helps to clear acne prone skin and restore a healthy and radiant complexion. SkinCeuticals A.G.E. 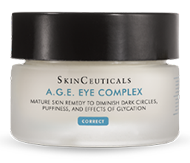 Eye Complex – A three-dimensional anti-wrinkle eye cream, A.G.E. Eye Complex helps to reduce the appearance of dark circles, puffiness and Crow’s feet. Its exclusive formulation hydrates and comforts dry skin, helping to improve the appearance of firmness and elasticity around the eyes.